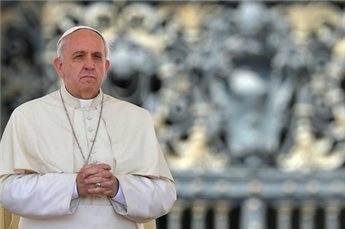 Pope Francis on Wednesday said his upcoming trip to the Middle East would be entirely devotional, aimed at praying for peace in the region and improving relations with other branches of Christianity. "It will be a purely religious trip," the Argentine pope told some 50,000 pilgrims at a general audience in St Peter's Square ahead of three-day trip to Israel, Jordan and the occupied Palestinian Territories starting on Saturday. Francis said the main reasons for the trip -- billed a "pilgrimage of prayer" by the Vatican -- were to meet with the Orthodox Patriarch of Constantinople Bartholomew I and "to pray for peace in that land, which has suffered so much". The visit kicks off on Saturday when Francis flies to Amman and meets Syrian refugees. He will then travel on to Bethlehem, Tel Aviv and Jerusalem, wrapping up the visit on Monday with a mass in the place where Christians believe Jesus had the last supper with his disciples. Francis will meet with all the main Israeli, Jordanian and Palestinian leaders, but only briefly. There has also been opposition from ultra-Orthodox Jews over perceived Vatican designs on holy sites in Jerusalem. 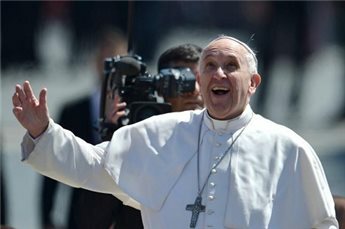 Argentine Rabbi Abraham Skorka, an old friend of Francis who will be traveling with him, said the pontiff would try to avoid political pitfalls in the sensitive region by dividing his visits equally between Jewish Israeli sites and Muslim or Christian landmarks in Palestinian territory. "He will try to be balanced," Skorka told journalists in Jerusalem. "He's going to make meaningful contact and interaction with the Palestinian people. But when he comes to Israel, I'm not sure whether the previous Popes went to Mount Herzl (the site of Israel's Holocaust memorial) to lay flowers there." Pope Francis is to pray at the Western Wall, the site of the first and second Jewish temples, and to visit Israel's national cemetery on Mount Herzl before going on to the Yad Vashem Holocaust memorial. Skorka condemned opposition by ultra-Orthodox Jews to the Pope's visit. "I'm totally against them (demonstrations against the visit). This is a visit by someone who is seeking a road to peace and dialogue and he should be received with open arms," Skorka said. "We cannot remain and live in a vicious circle of hate." Hundreds gathered last week near the reputed scene of Jesus's last supper in Jerusalem, demanding that Israel keep sovereignty over the site where Pope Francis will celebrate mass. It is currently the subject of negotiations between Israel and the Vatican, which hopes to recover the site, but no official agreement has been announced. On a lonely hill in northern Israel, a stone's throw from the Lebanese border, stands Iqrit church, one of the last vestiges of a village razed by Israeli troops in 1951. This small, white church is a symbol of the enduring memory and resistance shown by the Christians of historic Palestine who are reaching out for help to Pope Francis, who begins a three-day visit to the Holy Land on Saturday. 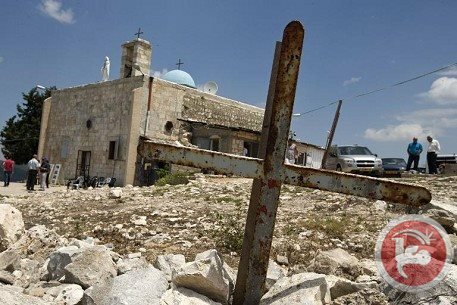 In a letter to the pontiff, the people of Iqrit and those of the neighboring village of Kufr Birim, all of them Catholics, beg him to "intensify" efforts to pressure Israel to end the injustice inflicted upon their community. "We hope that your upcoming visit to Palestine and Israel will serve towards that purpose," it said, describing themselves as internally displaced Palestinians within the State of Israel. In 1948, six months after Israel was established, the army asked Iqrit's 450 inhabitants to leave their homes for two weeks as a temporary measure due to military operations in the area. But they were never allowed to go back. In July 1951, the Supreme Court ruled the villagers should be allowed to return, but the government ignored the ruling. Five months later, on Christmas Eve, the army demolished the entire village, except for the church and its cemetery. The Palestinian Christians of Galilee, who hold Israeli nationality, admit some disappointment that unlike his predecessors, Pope Francis will not be visiting Christian landmarks in the north during his visit. "There is big disappointment in Galilee, where Jesus and his disciples preached," admitted a Catholic official. Iqrit's former residents, who number 1,200 and are scattered across northern Israel, are nonetheless hoping they will be able to personally deliver their letter to Francis when he arrives in Bethlehem on Sunday. "The State of Israel treats us as second-class citizens because we are not Jews. That is the main reason why our right to return has been denied," the letter says. "But with the strength that we take from our faith, we refuse to become a forgotten community." Barred by the Israeli authorities from returning to their village for more than six decades, the villagers made their case to Pope John Paul II in 2000, and to Benedict XVI in 2009. In August 2012, dozens of young people whose families originated from the village set up a makeshift camp outside the church, as they had done every summer. But this time, instead of camping out for just a week, they stayed and are still living there in prefabricated huts. "They prevent us from rebuilding and planting trees. But we will stay here. In the years since 1948, we have not forgotten our land, our homes nor our church," said 54-year-old George Sbeit whose parents were expelled from the village. "The young people are not going to leave. The third generation is stronger, better educated. Before, people were afraid. Today, the young people are not afraid," said Sbeit, a former karate instructor. His nephew, Walaa, said: "I won't let anybody drive me out". "I am here and I have the right to be here. We are the third generation, we are the ones who bring back life to this land," said the musician. The letter also raises concerns about the dwindling number of Christians in the Holy Land, blaming Israel's policies for driving "thousands of our sisters and brothers into exile." According to a survey carried out in April by Bernard Sabella, an expert on Palestinian Christians, 62 percent of those living in Jerusalem want to emigrate due to economic difficulties and the political stalemate. But whether they are living in Israel, in annexed East Jerusalem or in the occupied West Bank, the Christian community is looking to Pope Francis for encouragement. "Christian Palestinians are expecting a message of hope (from the pope)," said Father Jamal Khader, who heads the Latin Patriarchate seminary in the West Bank city of Beit Jala. "There is no perspective of peace. So we need the pope to encourage us and to strengthen us," he said. "He is a man of God, a good defender of all who are suffering, including the Christian Palestinians. We are hopeful he will see first hand what's going on here." When Pope Francis arrives in the Holy Land on his "pilgrimage of prayer," Israelis and Palestinians will both be looking to use the visit to score a few political points. For Israel, it will be a chance to draw world attention for something other than its ongoing illegal settlement activity in the occupied West Bank. "The very fact of the visit is a success," an Israeli official told AFP on condition of anonymity, as the tourism ministry said it was hoping the papal pilgrimage would drive a 10 percent increase in Christian tourism. In fact, the pope's "pilgrimage of prayer", which begins in Jordan on Saturday, will leave a relatively faint footprint in Israel. His visit to Israel and the occupied Palestinian territories will kick off on Sunday in Bethlehem. "He is taking a helicopter directly from Jordan to Palestine -- to Bethlehem. It's a kind of sign of recognizing Palestine," Father Jamal Khader of the Latin patriarchate in Jerusalem told journalists. 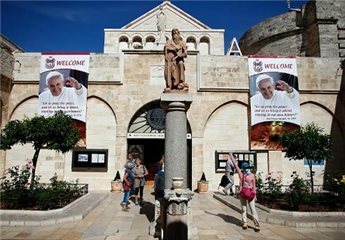 In Bethlehem, the pope will meet President Mahmoud Abbas and then celebrate mass in front of the Church of the Nativity, traditional birthplace of Jesus, before visiting a nearby refugee camp. "Knowing who he is, and his sensitivity for all those who suffer, I am sure that he will say something defending all those who are suffering, including the Palestinians who live under occupation," Khader said. After a short flight to Tel Aviv's Ben Gurion airport where he will be greeted by Israeli President Shimon Peres and Prime Minister Benjamin Netanyahu, he will hold a top-level meeting with Orthodox Church leaders, before spending the night in the residence of the papal nuncio in annexed East Jerusalem. Israel seized East Jerusalem in 1967 and calls the entire city its "united, undivided capital", in a move never recognized by the international community. It is there that he will spend much of May 26, apart from brief forays into Israel to pay his respects at the Yad Vashem Holocaust memorial and visit Peres and Israel's two chief rabbis. He will meet Netanyahu at the Vatican-owned Notre Dame complex, which lies on the seam line between east and west Jerusalem, for talks which will touch on politics, an Israeli official said. "We shall be able to explain to him, from our point of view, what's happening politically in the region," he said. "We shall explain to him the Iranian threat." During the visit, the pope is expected to call for a peaceful resolution of the conflict with the Palestinians. "The purpose of his visit is to encourage us not to be afraid of each other and to talk to each other and live together peacefully," Papal Nuncio Archbishop Giuseppe Lazzarotto told reporters on Sunday. Any reference he makes to Israeli settlements, to the West Bank separation barrier, or to the question of Palestinian prisoners or refugees will be closely watched by both sides. "Everything will be highly charged politically," said Hind Khoury, a former Palestinian minister for Jerusalem affairs. Following the collapse of US-led peace talks last month, the PLO has resumed moves to seek recognition for their promised state in the international diplomatic arena and will be looking to the papal visit to provide fresh ammunition. "This visit will help us in supporting our struggle to end the longest occupation in history," said Ziyyad Bandak, Abbas' adviser for Christian affairs. "He will have a lunch with Palestinians, with families suffering from the occupation... then he will visit Duheisha refugee camp to witness the suffering of Palestinian refugees," he told Voice of Palestine radio. For Israel, it was a political slight that "the pope will begin his visit in Palestine and not Israel", he claimed. "I know that Israeli officials are not happy with this decision." The very fact of the visit was tantamount to Vatican support for an end to Israel's occupation of the Palestinian territories, Bandak said. "We welcome this visit and consider it as support for the Palestinian people, and confirmation from the Vatican of the need to end the occupation." Earlier this month, Latin Patriarch Fuad Twal, head of the Roman Catholic church in the Holy Land, warned that hate crimes targeting Muslim and Christian Palestinians was poisoning the atmosphere ahead of the pope's visit, with church officials "very concerned" about the lack of security. Israel's top police officer on Sunday vowed that Jewish extremists would not be allowed to spoil the upcoming visit of Pope Francis by vandalizing Christian holy places. "You cannot exaggerate the importance of this visit on both a national and an international level," Police Commissioner Yohanan Danino told reporters in Jerusalem. 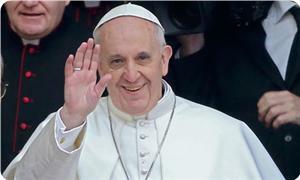 The two-day papal visit to Israel, which begins on May 25, was being treated by police with the same level of importance as that of US President Barack Obama, with an extra 8,000 officers to be deployed throughout Jerusalem, he said. And he pledged that Jewish extremists responsible for a wave of racist anti-Arab attacks, which have also found expression against Christian and Muslim holy sites, would not be allowed to spoil the visit. "All sorts of extreme elements ... are trying to create pressure and the impression of pressure. We are rejecting this pressure and we won't let them succeed," he said. "We will do everything to ensure they won't harm Christian holy places ... and to ensure the trip goes successfully." Earlier this month, Latin Patriarch Fuad Twal, head of the Roman Catholic church in the Holy Land, warned that hate crimes targeting Muslims and Christians was poisoning the atmosphere ahead of the pope's visit, with church officials "very concerned" about the lack of security. Israel has been struggling to contain a spiraling number of so-called "price tag" hate crimes by Jewish extremists targeting Palestinian and Arab property, which has included an increasing number of vandalism attacks on mosques and churches. Although police have made scores of arrests, there have been no successful prosecutions, and the government has come under mounting pressure to authorize the Shin Bet internal security agency to intervene. A suspected Price Tag attack has targeted Thursday the Romanian Orthodox Church on Masrara street in occupied Jerusalem, in the latest of a series of hate crimes against Christians and Arabs. The Price Tag attackers stoned the church. A nun was slightly injured in the attack. The attackers have also beaten the Deacon Elias Soryani while trying to prevent the attack, local sources revealed. 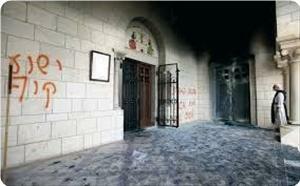 Price Tag groups have recently escalated their attacks against Islamic and Christian holy sites. Israel said it had "no intention" of giving the Vatican sovereignty over a sensitive holy site in Jerusalem, following protests by ultra-Orthodox Jews ahead of Pope Francis' visit this month. "Contrary to rumors in Israel, there is no intention to transfer to the Vatican sovereignty or ownership on the Tomb of David or the Cenacle," Israel's ambassador to the Vatican, Zion Evrony, said in a speech obtained on Wednesday. The Cenacle is the reputed scene of Jesus' last supper, and the pope is planning to hold a mass on the site on Mount Zion near the walls of the Old City. Jews revere the site as the tomb of Kind David, which is on the ground floor of the same building. It is also important for Muslims. The site is currently part of long-running negotiations over Holy Land property between Israel and the Vatican, which hopes to be given the right to use the site. 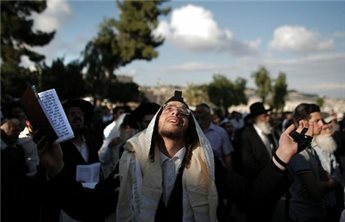 Hundreds of ultra-Orthodox Jews on Monday held a protest near the site, demanding that Israel retain sovereignty. They are also planning another demonstration on May 22 -- just three days before Pope Francis arrives. Francis is traveling to Israel, Jordan and the Palestinian Territories between May 24 and 26. Israeli President Shimon Peres told an Italian newspaper during a visit to the Vatican last year that a compromise had been reached on the Cenacle, and that "99 percent" of the issues concerning the site had been addressed. 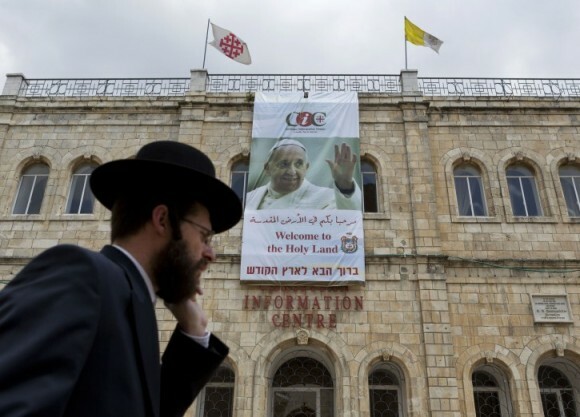 The Israeli police have requested that a welcome poster for Pope Francis' eminent visit be removed from a building belonging to a church near Jaffa Gate, to avoid "inflaming Jewish passions". "This rude act will only strengthen the Christian and Muslim unity from all over the Holy Land to prove that Jerusalem is an Arab city with a Christian and Islamic civilisation, and no Judaisation programme or ethnic cleansing crimes will erase this well established fact in the hearts of each and every one of us... This is our city and we will build mosques and churches and we will receive or expel whoever we want, but when the occupation wants to control it and its people and regards them as temporary residents, this would cause a rift." 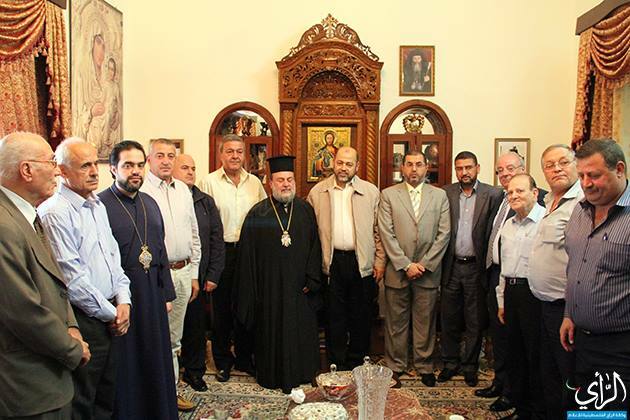 He further stated, "The National Christian Assembly is sending messages to all churches around the world to expose the Israeli practices, including the Jewish terrorism represented in this request." Pope Francis is due to visit Bethlehem at the end of May.